Rocket Matter Knowledge Base Additional Billing Options.How to make an adjustment to the Matter Ledger. 1. 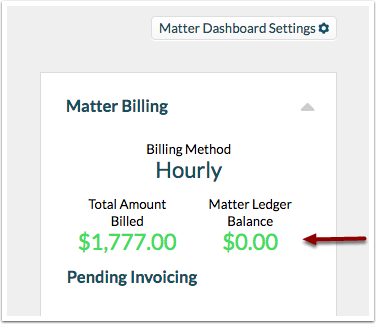 From your Matter Dashboard, click on the "Matter Ledger Balance" under Matter Billing. 2. To add a credit or debit adjustment, select "+ add an adjustment". Credit adjustment: A positive credit line item which is added to the matter ledger for purposes such as carrying a positive balance over from a previous application, correcting an error or applying any other miscellaneous credit adjustments. Debit adjustment: A line item deduction which is added to the matter ledger for purposes such as carrying a negative balance over from a previous application, correcting an error or applying any other miscellaneous debit adjustments. 3. Choose Credit-Adjustment or Debit-Adjustment from the drop down. Enter the date of the adjustment and the amount of the adjustment, include a description and click on "Add" to save.